There really is no way to ever repay a mother for the love and support she has given you throughout the years. Show her your appreciate on your wedding day with a special toast for her. 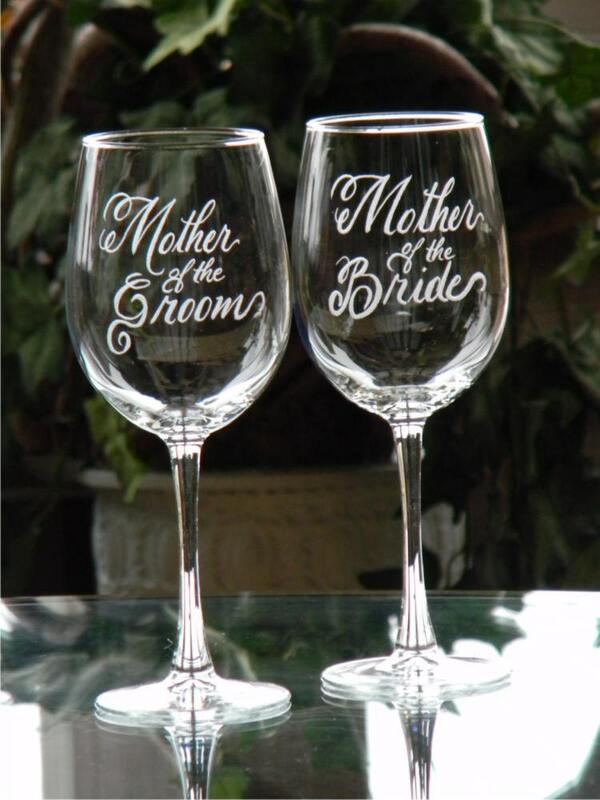 I engrave these wine glasses for the Mother of the Bride and Mother of the Groom in my hand written script lettering and add your wedding date to the base of each. Each glass can be customized for Mother, Sister, Father, Brother, Bridesmaid, Groomsman, Best Man, Maid of Honor, etc with any title of your choice. Please convo my first if you would like more that the title and date as shown on each glass. *Engraving Included: 4 word title in script with date on base. When adding the bride and groom's names AND the date on the base the date will be engraved on the same side of the glass that the title is on and the bride and groom's names will be engraved on the reverse side of the glass base. This engraving is done by hand. Each letter is hand written using a rotary diamond tip tool and is permanently etched into the glass. No two letters are exactly the same, variations are to be expected and appreciated as part of the beauty of this hand crafted glassware. The glasses arrived today ~ soo timely. They are everything I had hoped for. We are very satisfied pleased. Thank you for your prompt professionalism.